Having come to our toddler classes when her girls were little, Vanessa has been a core member of our tutor team for 10 years. 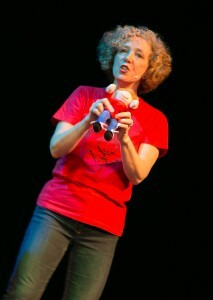 Vanessa runs baby and toddler groups in St Margarets, Twickenham and Teddington, sessions for families at local Children’s Centres and schools, Evelina Children’s Hospital and you’ll see her at many of events too. She harmonises like a dream, bakes cakes like Mary Berry and is pretty handy at the Uke to boot! Lucy has been a member of our team since 2015. Lucy has been volunteering and running art workshops at MeToo&Co (a local charity supporting children with additional needs and their families). 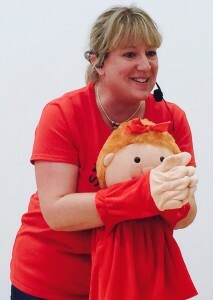 Lucy runs baby and toddler classes in Twickenham and Teddington, sessions for families at local Children’s Centres and schools, Evelina Children’s Hospital and you’ll see her at many of our ad-hoc events too. Lucy & Vanessa love singing in a in a choir every week – even more music in their spare time! Debbie has worked for over 10 years in an Early Years setting and has experience as a 1:1 LSA for children with SEN. Debbie runs baby and toddler classes in St Margarets and Teddington, sessions for families at local Children’s Centres and works at both GOSH and Evelina Children’s Hospital. 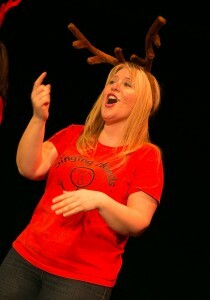 She is music-mad and can play all manner of wind instruments – she played the sax and clarinet on our Pop songs DVD! Our office ANGEL! Debs keeps this whole show on the road and enables us to get on with the important job of jumping around with chicken hats on our heads and looking like twits. Debs is responsible for actioning all our random requests ranging from sourcing a big, rubber rhino or a kangaroo onesie to organising our cashflows, paying bills and doing our VAT returns. Every office should have a Debs! Zoe is Debs’s office side-kick. Zoe came to our classes many years ago with her little boy. Zoe gets the resources ready each Friday so that our tutors have kits that are jam-packed full of multi-sensory goodies for the following week’s classes. Like Debs, Zoe’s job can range from the vital task of replacing a toy goat with a missing ear or finding a giant toothbrush to organising our Newsletters, creating Excel spreadsheets, taking care of stock control or processing and reconciling orders – variety is the order of the day! Brenda is our Marketing and Events Co-ordinator. Brenda has worked with us for over nearly 10 years and is the one to speak to if you’d like us to come and deliver an event or visit your school, so do get in touch, she’d love to hear from you! Belinda is our number-crunching book-keeper. She does it so we don’t have to! Belinda and Debs are our Wednesday morning numerical dream team.